Collaborative divorce is not a new concept, but it was not until July of last year that Florida lawmakers adopted The Collaborative Law Process Act, which creates a new alternative to litigation in family matters throughout the state. 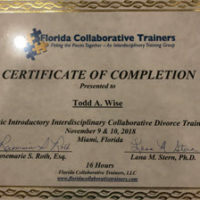 According to the Florida Academy of Collaborative Professionals, an organization comprised of financial and mental health professionals and family law attorneys, 34 percent of collaborative divorces are completed within just three months, while the remaining 66 percent are completed within six. In addition to the time benefits, the collaborative process is a method by which couples can resolve their differences via voluntary settlement negotiations rather than litigation, which means, couples can divorce with dignity and privacy. A collaborative divorce does away with the whole “fight and win” concept of traditional divorce. In a collaborative divorce, the goal is to “troubleshoot and problem solve,” and negotiate for an outcome that is fair and reasonable for all parties involved. This type of divorce involves mediation and negotiation. Collaborative divorce is effective at resolving,. Collaborative divorce requires both parties to cooperate; if one spouse is reluctant or unwilling to participate in mediations or negotiations, the process may be fruitless. What Does a Collaborative Divorce Look Like? Divorce is never easy, but it does not have to be hard. If you and your spouse want to part ways as amicably as possible, and if you want to end your marriage privately, contact WiseLieberman, PLLC, to schedule a consultation with one of our Boca Raton divorce lawyers. We are more than happy to discuss your case and to help you determine whether or not collaborative divorce is right for you.